Sriram Subramanian, an economics graduate from Brown University, worked in the US politics, got a postgraduate degree in Transport Modelling from UCL and spent three years with PwC consulting on the UK taxes before returning to India to work in education sector. His venture Callido Learning is a Mumbai-based tech startup which develops online skill development programme. Talking about the education scenario the world over Sriram thinks, “The best universities around the world expect students to solve problems, write effectively and think critically. Employers expect the same skills at a higher level.” Sriram is one of three co-founders of Callido Learning. 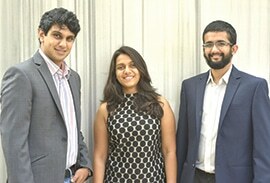 Chinmaya Kulkarni and Madhu Agrawal, Sriram’s co-founders at Callido Learning also embody these transferable skills. Chinmaya is a geologist turned energy consultant turned automotive researcher while Madhu is a UK qualified solicitor who quit her job at a Magic Circle law firm to become an educationist. “Sometime in 2013, we asked ourselves what the biggest challenge was and why we weren’t already working on it”, says Madhu. “It became glaringly obvious that the greatest challenge was the gap between our content-driven education system and real-world demands. A survey by the Economist confirms this view: business leaders ranked ‘problem-solving’, ‘team-work’, ‘communication’ and ‘critical thinking’ as the skills are essential to workplace success. To address this challenge, the Callido team developed an interactive online programme called ‘Basecamp’ which simulates a research project. “Students in Basecamp develop critical skills through immersive scenarios and challenging exercises. The online platform makes it flexible – take it anywhere, anytime. The data analytics and personalised reports allow parents and teachers to track progress,” says Chinmaya, who takes pride in teaching 21st century skills with 21st century tools. The initial version of Basecamp is aimed at students of the International Baccalaureate Diploma Programme. By popular request, a version of the programme for a wider audience will be released later this year.